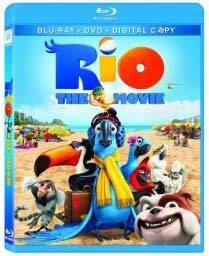 Animated movie Rio arrived for the home market on Aug. 2, 2011, from 20th Century Fox Home Entertainment. The two-disc DVD was priced at $34.98 and the Blu-ray/DVD combo (including a digital copy) at $39.99. A Blu-ray 3D version was released on Aug. 30. The PG-rated family film, about the titular domesticated macaw from small-town Minnesota who meets the bird of his dreams and then embarks on an adventure to Rio de Janeiro, features the voices of Anne Hathaway (Love and Other Drugs), Jamie Foxx (Ray), Jesse Eisenberg (The Social Network), Leslie Mann (I Love You Phillip Morris) and Jane Lynch (TV’s Glee). It grossed some $137 million at the domestic box office since its theatrical release in April.